The stadium is two-thirds complete. When it opens, the stadium will measure more than 3 million square feet and will be the largest in the NFL. A construction worker stands amidst the towering roof over the new NFL Los Angeles Stadium while under construction in Inglewood, Calif. on Monday April 15, 2019. Stadium officials hosted a tour for the media after the final piece of the canopy structure to hold the roof was completed. The steel roof shell is one of three parts of the canopy. 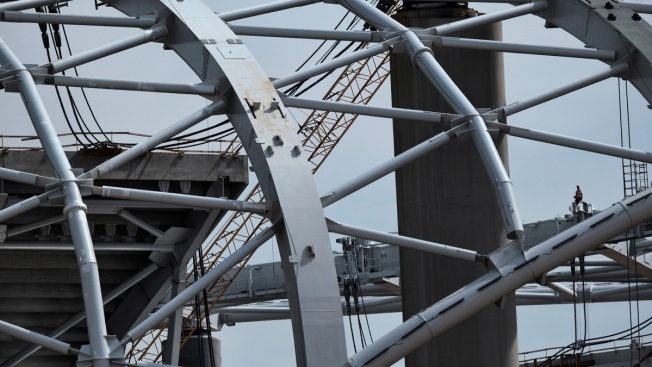 The other two parts are the cables to keep the roof and suspended Oculus scoreboard in place and a single layer of ETFE (Ethylene Tetrafluorethylene), which is a lightweight and transparent plastic. It was also used to construct the roof of US Bank Stadium in Minneapolis, which hosted the 2018 Super Bowl and this year's Final Four. 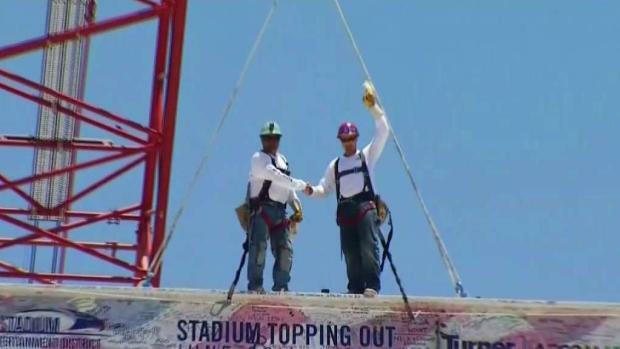 Construction on future home of the Rams and Chargers hit a major milestone Thursday when the highest beam in the stadium was laid into place. Mario Solis reports for the NBC4 News at 4 on Tuesday, June 26, 2018.